A good German shepherd with a balanced temperament is the most capable and trainable breed from the entire dogdom. First of all you need to find a dog such as a German shepherd pup in Canada, but how easy it is to train the puppy depends on the behavior and personality of the individual dog, your training skills and the relationship between you and him. 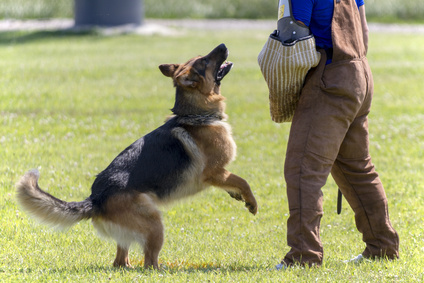 Following are some of the easiest ways to teach basic commands and tame your German shepherd. Getting started with a puppy can be good in many ways because your little dog is growing and absorbing things and you have the opportunity to mold his behavior while developing the bond in early stage. Begin training sessions with the puppy when he is around 8 weeks old and begin with socializing him because German shepherds can be very protective and possessive for their family. Gently start to handle your puppy’s little paws, tail, ears etc to prepare him for future grooming and veterinary visits because he is going to be a big dog one day and he must get used to human handling. By doing so you can easily prepare him for temperature taking, ear cleaning, nail trimming, and other procedures which can be difficult to accomplish later if your giant dog isn’t used to it. Starts training the puppy with basic commands like teach him to sit, stay and heel along with other house training. Be patient if your puppy is not doing exactly what you asked him to do because he won’t understand your command immediately. If you think you’re frustrated or going to lose patience then end the training session with a smile because your dog can sense the frustration through your body language. NEVER yell at your puppy or create fear of something to reinforce your commands, instead use food treats and praise. Generally, German shepherds love to learn and play and you can easily motivate them to a great extent by just rewarding treats. Use treats and praise your dog when he understands your command i.e. immediately give him a treat when you ask him to stay or sit and he goes in that position. It’s important to teach your puppy that humans are not a threat to their food bowl. Get close to him while he’s enjoying the meal and if he shows any sign of aggressiveness like growling then handle the behavior by adding more food to the bowl. You can also handle the food aggression by feeding the dog with your hand, show him that you control the source of food and he will be rewarded for ‘good’ behavior.